Dandelion is an extremely common plant found worldwide. It grows to a height of about 12 inches, with oblong, green leaves and distinctive yellow flowers that bloom year-round. When the plant matures, the flower turns into a fuzzy, globe-shaped cluster that contains seeds for propagation. In many countries, dandelion is used as a food. It contains high amounts of vitamin A, and smaller amounts of vitamin C, vitamin D, various B vitamins, iron, silicon, magnesium, manganese, selenium and zinc. Dandelions leaves are used in salads and teas, and since the plant is closely related to chicory, its roots are sometimes used as a coffee substitute. Both the leaves and root are used in herbal preparations. Why do we need dandelion? What is it used for? Historically, dandelion has been used to treat problems relating to the liver, gallbladder, kidneys and joints. Dandelion leaves and root have been used to treat constipation, indigestion, heartburn, and to remove water from the body, while the root is used to increase bile production in the gallbladder and to treat liver problems. 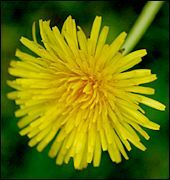 Animal studies have found that dandelion leaves act as a diuretic and are comparable to prescription medications for their effects, but these studies have not been conducted in humans. In traditional Chinese medicine, dandelion is used during instances when there is liver involvement with heat and toxins in the blood. These conditions include jaundice, hepatitis, urinary tract infections, red or swollen eyes, and abscesses. How much dandelion should I take? As a liver tonic or to stimulate digestion, many herbalists recommend 3-5 grams of dried dandelion root or 102 teaspoons of a dandelion tincture three times per day. As a diuretic, 4-10 grams of dried leaves can be added to one cup of boiling water and drunk as a decoction, or 1-2 teaspoons of fresh dandelion juice combined with milk can be used three times per day. Fresh dandelion juice is considered the most effective. What forms of dandelion are available? Dandelion is available either fresh or as a dried root. Some stores sell dandelion tinctures, extracts and infusions. Dandelion juice can be made by pressing the leaves. What can happen if I take too much dandelion? Are there any interactions I should be aware of? What precautions should I take? Because dandelion stimulates production of bile, it should not be used by patients with gallstones or an obstruction of the bile ducts. Patients with stomach ulcers or gastritis are generally encouraged to avoid dandelion, as it may stimulate overproduction of stomach acid. The milky substance in the stem and leaves of fresh dandelion may cause an allergic rash in some people. People with a confirmed sensitivity to inulin, a fiber widely found in fruits, vegetables and plants, should avoid dandelion. Certain medications may interact with dandelion. Loop diuretics, spironolactone, thiazide diuretics and triamterene may all react adversely with dandelion products. It may also reduce the effectiveness of the antibiotic ciprofloxacin. Blumenthal M, Busse WR, Goldberg A, et al. (eds). The Complete Commission E Monographs: Therapeutic Guide to Herbal Medicines. Boston, MA: Integrative Medicine Communications, 1998, 11820. Foster S. Herbs for Your Health. Loveland, CO: Interweave Press, 1996, 267. Popov AI, Gromov KG. Mineral components of dandelion leaves. Vopr Pitan May-Jun 1993;(3):57-8. Wichtl M. Herbal Drugs and Phytopharmaceuticals. Boca Raton, FL: CRC Press, 1994, 4869. Williams CA, Goldstone F, Greenham J. Flavonoids, cinnamic acids and coumarins from the different tissues and medicinal preparations of taraxacum officinale. Phytochemistry May 1996;42(1):121-7.